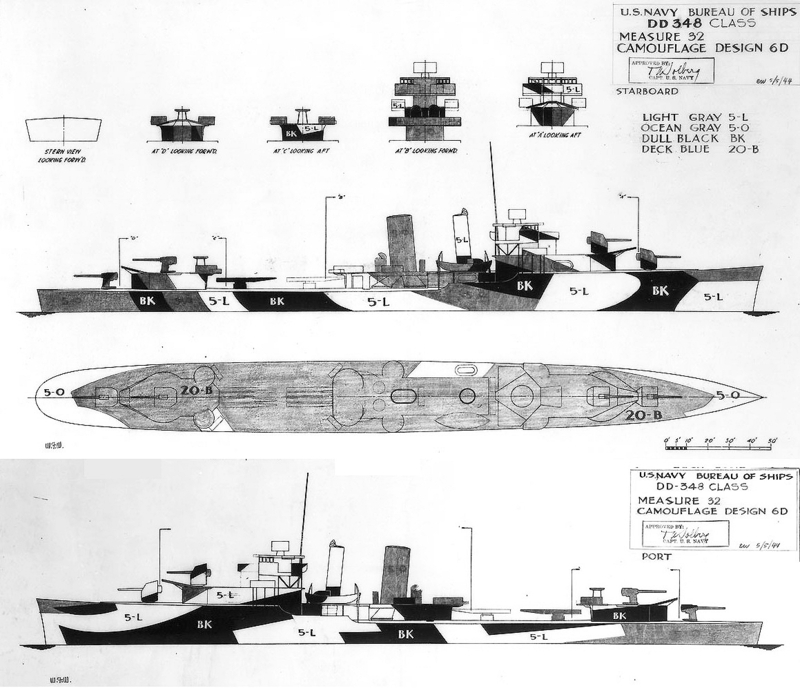 The drawing for Design 31/6D for the Faragut class dated July 1, 1944. This drawing shows three vertical colors: haze gray (5-H), ocean gray (5-O) and dull black (BK). The horizontal pattern colors are the standard ocean gray(5-O) and deck blue (20-B). Note how the bow ocean gray panels on each side meet and wrap around. The port side drawing labels the lightest panels “ 5-L” it may be that the Measure 32 drawing was modified by altering labels and these were missed. 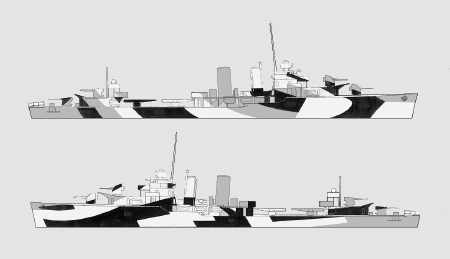 This could be another example of how busy the camouflage section was to produce design drawings quickly. The first drawing for Design 6D was included with the July 15, 1943, memo to PacFleet for the Fletcher class destroyers. Another Design 6D drawing for Fletcher was dated December 22, 1943, and it was redrawn on January 19, 1944, for the Cleveland class light cruisers and was worn by USS Birmingham (CL-62) and USS Vicksburg (CL-86) in Measure 33 colors and reportedly by USS Biloxi (CL-80) in Measure 32 colors. It was also worn by the battleships USS New Mexico (BB-40) and USS Mississippi (BB-41). Original drawing source: NARA 80-G-176511 and 80-G-176512.